On March 7, 1961 a musical legend was born. 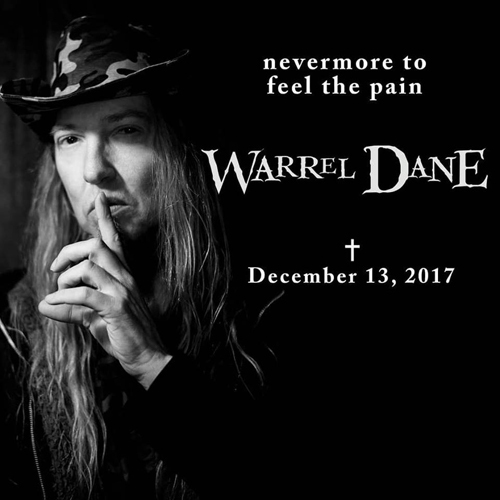 Warrel G. Baker, who would later be known to the world as Warrel Dane, was the seminal voice of the power metal generation. With the advent of SERPENT'S KNIGHT in the Seattle area to the band that would eventually become SANCTUARY, Dane became a staple of the West Coast metal community. Dane passed away this morning at the age of 56 at his apartment and studio in Brazil where he was working on his second solo album for Century Media records. There were also plans for SANCTUARY to tour as direct support for ICED EARTH in early 2018 and a new studio album was in the works for the band. In 1987, Warrel and bandmates Jim Sheppard, Lenny Rutledge, Sean Blosl and Dave Budbill released SANCTUARY’s debut album, Refuge Denied. Produced by Dave Mustaine, the album put the band on the metal map and became a cult favorite. Dane’s combination of piercing high vocals and deep baritone were not like anyone else. He was a favorite of fans and the media. The first album received rave reviews and the band began work on their sophomore effort. 1990’s Into The Mirror Black allowed the band to reach higher and the video for the first single, “Future Tense”, had continuous play on Headbanger’s Ball and other video outlets. The band was able to enjoy tours as both a headlining act and as support for larger acts in the United States and Europe. Unfortunately, even after the success of the album, the band split, but that didn’t keep Dane down. He and Sheppard moved forward and formed NEVERMORE with guitarist Jeff Loomis and drummer Van Williams. The band’s self-titled debut in 1995 for Century Media Records clued fans in to the fact that their favorite singer was back with a new project and the band went on to record nine studio albums between 1995 and 2010. In 2008, Dane recorded his first solo album for Century Media called Praises To The War Machine and it received critical acclaim and commendations. During this time, Dane began working with musicians from around the world to compile the best players to work on his solo music. He played select shows to celebrate the album’s release in between tours and recording with NEVERMORE. In later years, Dane worked with his bandmates in Brazil to work on a commemorative tribute tour for NEVERMORE’s most highly lauded album, Dead Heart In A Dead World. He would travel abroad for a number of touring engagements for his solo and tribute work. Much to everyone’s joy, in 2014, SANCTUARY reformed and released The Year The Sun Died, did a world tour, and in January of 2017 they released remastered demos that were uncovered and recorded prior to the release of Refuge Denied. This album, Inception, is part of my top releases for 2017 in our KNAC.COM top picks report. Dane was in Brazil working on his second solo effort with bandmates Thiago Oliveiro, Fabio Carito, Johnny Moraes and Marcus Dotta at the time of his death this morning from cardiac failure. He is survived by his bandmates, his sisters and their spouses and children, and was preceded in death by his parents and brother. Please keep his closest friend and bandmate, Jim Sheppard close to your heart during this time of deepest sympathy. Please keep his family and friends in your thoughts as this will be a difficult time for us all, as well as it will be for his very large fan base.